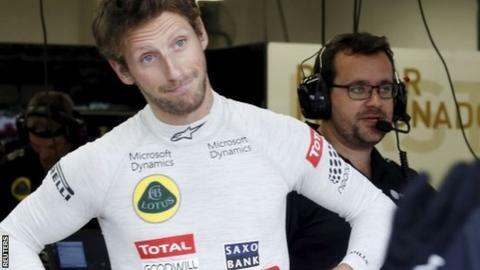 Lotus driver Romain Grosjean had to do interviews in the rain and was fed by Renault before the Japanese Grand Prix. The British-based constructor face an uncertain future amid mounting money problems, and they were locked out of their hospitality tent on Thursday. "It's good to see the hospitality you get in the paddock when you are running out of food and the other teams are opening their doors," said Grosjean. Lotus are in court for a third time on 28 September over an unpaid tax bill. Some of the freight for this weekend's race, including the pool of Mercedes engines, only arrived in the paddock shortly after lunch on Thursday. Despite his team's problems, Grosjean finished third at the Belgian Grand Prix last month. "Hopefully it should all be sorted and the most important thing is we have what we need to race. "It does not mean we can't fight for podiums this weekend," said Grosjean. "Look at Spa, we had bailiffs in the garage and we ended up on the podium. "It is a situation which is very tricky. We are waiting for answers and confirmation for the future of the team, but the spirit is still there." Lotus are in talks with car manufacturer Renault over a takeover deal to secure their Formula 1 future. Grosjean appears set to leave the cash-strapped outfit at the end of the season with newly-formed American outfit Haas likely to be his destination. Venue: Suzuka, Japan. Dates: 25-27 September. Coverage: First and second practices - Friday, 25 September - 01:55 BST and 05:55 BST on BBC Two and BBC Radio 5 live sports extra. Final practice - Saturday, 26 September - 03:55 BST on BBC Two and BBC Radio 5 live sports extra. Qualifying - Saturday, 26 September - 06:00 BST on BBC One and 06:55 BST BBC Radio 5 live sports extra. Full live text commentaries will also be available on the BBC Sport website, mobile and app.